CrowdSavvy is a Software as a Service (SaaS) provider which allows mobile app developers and publishers to measure their customers’ experience. Developers get access to an easy to use online dashboard displaying complete reports and tools for creating and managing surveys. These tools empower the app developer to learn about your customers. CrowdSavvy was created by app developers for app developers, people dedicated to build great software, so you can achieve your goals. complete reports and tools to create and manage surveys and polls by allowing developers access to a simple to use online dashboard. 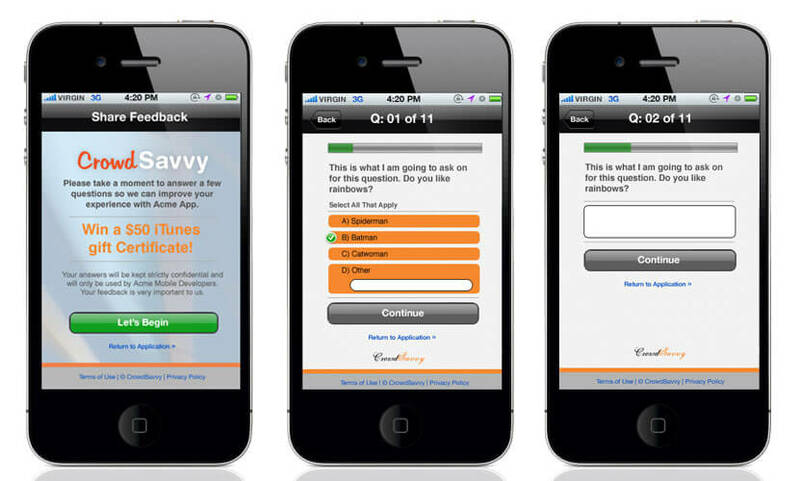 EASY TO INTEGRATE – the app offers complete functionality for the mobile developers to publish the surveys into their iOS or Android apps. FLEXIBILITY – CrowdSavvy is developed with flexibility in mind, so the API makes use of HTML5 technology to make it available on a wide range of mobile devices and ensuring new functionality, that will be available straight away, without the need of updating the mobile application. NO INTERNET CONNECTION – by making the surveys available locally, even if the smartphone is not connected to the Internet, the users can fill them in.